New York Slice is a game that really surprised me – I wasn’t expecting to like it from the elevator pitch. I gave it a try purely because it offered me respite from the hordes of humanity that engulfed every inch of the UKGE convention hall. I’m very glad I did though because despite reservations this is a game that is as appealing as the real life pizzas that continually clog up my arteries. Even though it’s made of cardboard, it’s a game that’s very easy for people to swallow. Incredibly simple, and yet deeply involving. We gave it a meaty four stars in our review. If your mouth is watering for the game we described there let’s find out if the flavour of its accessibility is to your liking. Imma slice this teardown into multiple segments, and you should pick the one that appeals most to you. We can give New York Slice a clean bill of health here. Really, there are only two components in the game that need to be considered. 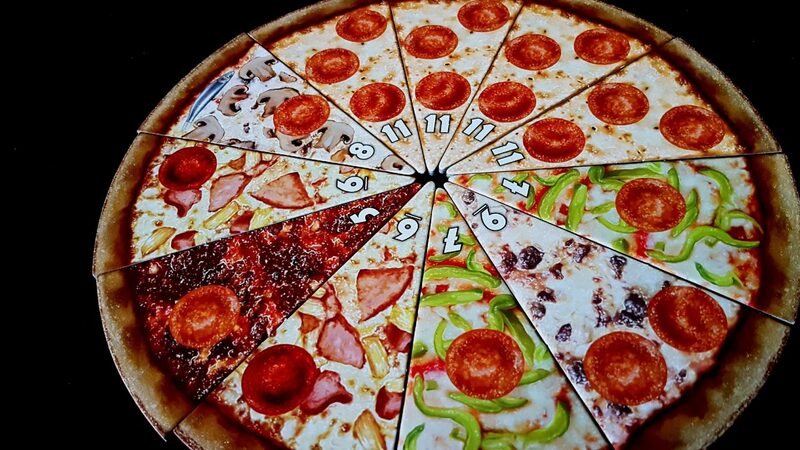 One is the pizza itself – each slice is differentiated by a unique graphical design as well as a number displayed at the tip. 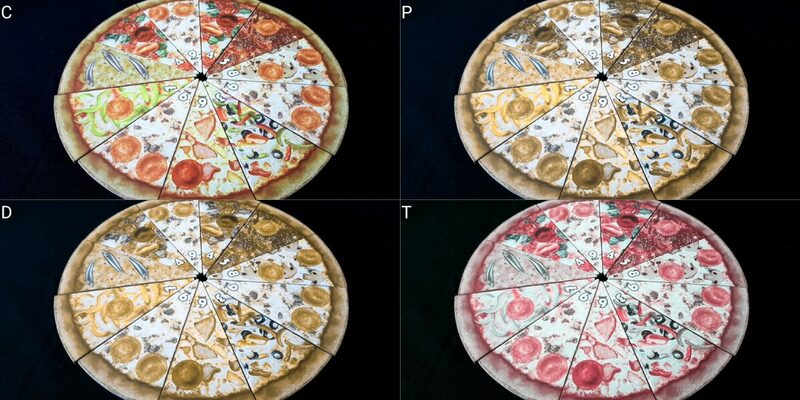 While those with full colour discrimination will have an easier time of telling pizza composition at a glance, no information is lost to those without. I might just let you eat a couple of those by yourself. Special tiles likewise are easily differentiated – they’re made up of prominently displayed text emblazoned in the centre of a chunky tile. There is a colour system in place here but I don’t think it’s used to encode any information. It just seems to be entirely aesthetic. Even if it’s not, you can play without knowing what the colours mean, if anything. We strongly recommend New York Slice in this category. As is often the case, those for whom total blindness must be considered will find the game almost entirely inaccessible. While there is a significant amount of differentiation between pizza slices, there’s a lot of similarity in the graphical design of certain elements. These occasionally come together in a way that is likely to lead to mild confusion for visually impaired players. Coupled to this, contrast on certain parts of the slices is very poor. Consider the pizza above – the numbers are well contrasted on the 5 slice, but much less so on the 9 slice. The pepperoni slices are extremely clear on the 11 slices, but not nearly so clear on the 5. The pepperoni on the 6 slice is easy to mistake for the background graphical detail. Those pineapple and ham elements too can easily be mistaken for the mushrooms on the 8 slice if visual acuity is low. These aren’t necessarily critical issues, but they are impactful on play and likely to lead either to a degree of querying of game state from the table, or a number of otherwise avoidable mistakes. Luckily, the information cost of asking the table about slices can be mitigated with timing. Asking about the presence of particular slices will draw attention towards your likely intentions, but you don’t need to evaluate this information until it’s your turn to pick a slice. Your choice in this is entirely passive – you’ll get to select from what is left regardless of what you say or do. This in itself leads into one of the positive accessibility features of New York Slice – the visual puzzle is highly compartmentalized by design. If you are not slicing the pizza, you only ever need to assess slices in terms of their components. You don’t need to worry about the pizza as a whole. In this, you’re only considering a few elements, specifically ‘what slices am I collecting’ and ‘what slices are available’. That’s great, but unfortunately all the gains here are almost instantly cleared away by the competition of play. The choice of your slice isn’t necessarily based on what’s best for you, but what’s optimal for minimising the scoring of your opponents while maximising the scoring for yourself. If multiple players are competing over particular sets that will change the way in which their collection must be prioritised. If you have two 5s, and someone else has two 5s, then the value of 5s for both of you is either multiplied or nullified depending on whether you want to make a fight of it. Correspondingly, the value of 5s for everyone else is reduced. The value of a 5 is a product of the game state around the table, and evaluating that requires a lot of visual parsing. If you are the slicer, the job becomes more complex still – you need to not only consider what it is that everyone wants, but also how you can arrange the pizza to minimise the harm to your own future prospects. More than this, for more advanced play you need to consider what other people might do to undermine the players that pick after them. While the act of slicing the pizza itself is not inherently visually inaccessible, the thought that goes into how it should be sliced is considerable. That thought process needs to be intensely informed by visual information. A player can certainly query the table about what each player has collected but it’s a lot of information to track and cross-reference. New York Slice would perhaps lend itself to play with a supporting tool like a spreadsheet, but I think there would still be too much to conveniently consider in play. The pieces, due to their physicality, lend a tactility to investigation – at least in terms of the ones in front of any given player. However, there is no way to tell pizza slices of one value from another – they differ only in terms of graphical style. There is scope for improvement here though, since none of the information in the game need be hidden except for the composition of future stacks, and this can be obscured easily enough through other mechanisms (such as drawing from a bag). The specials tokens are clearly contrasted in a large, clean font across the centre of the tiles. The instructions that accompany them though are often quite information dense. This at least is a temporary problem since familiarity with the game rules will mean the instructions are eventually not required. In the mean-time, there is nothing lost by the slicing player reading the special out at the beginning of the round. With all this in mind, we don’t recommend New York Slice in this category but we suspect it is likely playable with support if someone is especially keen. 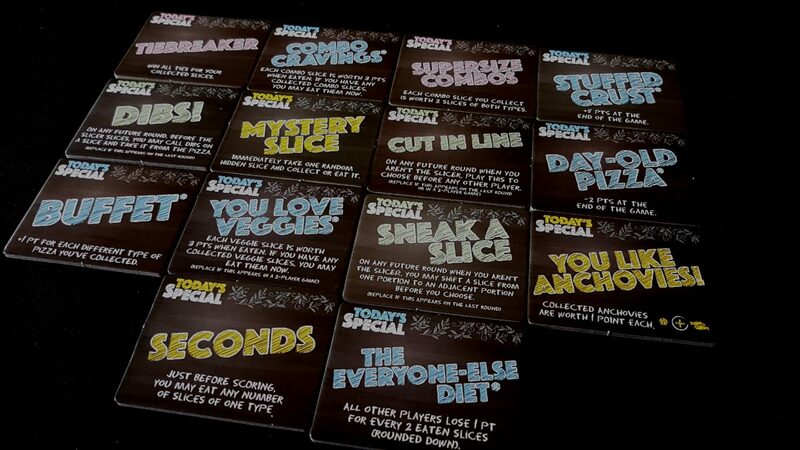 New York Slice is a game of intense consideration – fully literate play involves being aware of the implication of each slice. The rules are trivial, but the gameplay requires surprisingly large amounts of cognitive processing. This crosses the spectrum of active consideration and working memory. It is not possible, in our view, to play New York Slice well without stressing cognitive faculties across the board. However, that’s not necessarily a deal breaker in this category since we always consider whether there’s fun to be had from either not playing well, or playing with a more cognitively accessible variant. Here, we have good news because I think the answer is yes in both categories. In New York Slice you’re not really competing against any of the other players. You’re competing against the table in its aggregate. It’s unlikely that anyone is going to be able to get a pizza slice they really want, so everything is always a case of minimising damage to your standing. Every slice of pizza is (usually) valuable to someone at the table, even if that someone may not be you. Picking up lots of low-scoring slices is as feasible a strategy as aiming for the high-contention, high-scoring options. Simply eating all the slices that come your way can earn you a victory if competition over the sets is fierce. As such, it’s possible for a player to do well without necessarily playing well. The better players will tend to win here, but it’s not guaranteed because of the rotating nature of selection. When you’re choosing between two bad slices, how well you could have done had you picked earlier is largely immaterial. The ebb and flow of opportunity is something of an equaliser, and the randomness of pizza composition means that you’re often choosing at best between sub-optimal opportunities. It’s rare that there is a slice that is perfect for you – it’s normally a blend of the good and the bad. Likewise, it’s rare that there is a slice that is absolutely terrible because the slicer doesn’t want to be in the position of being left with it. All the choices you have tend to be a compromise of one form or another. With that in mind, players with light cognitive impairments may find that they do reasonably well even without the complex calculation and cross-calculation of decision making. If that by itself is not sufficient, there are ways to simplify the game a little through existing rules. You can eliminate the specials for a simpler game, or use only the less complex of these. You can remove the wildcard slices, or the combo slices, although you’d need to make some alterations in the stacks you distribute as a consequence. Or, you can adopt a less adversarial scoring system that still permits people to score slices in sets they didn’t dominate. Half points for example. There is, we think, a range of satisfying variants that greatly reduce the cognitive burden that goes into effective play. However, that’s not to say that we can enthusiastically recommend the game. There is explicit numeracy required throughout, and even if using simplified scoring the act of cutting a pizza is complex. Some simple guidelines can be used to help people (break up adjacent numbers, for example). It’s still going to be difficult to do this in a way that ends up with the slicer having something worth their time when they get to pick. There is too an element of risk assessment and probability that goes into aiming for particular sets and in assessing what sets other people may be collecting. Turn order is consistent, for the most part, but if using certain specials there are some consumable powers that drastically alter what happens in a turn. You might be able to skip the queue, or adjust slices before you pick. You might be able to nab a slice before a pizza is separated, or alter the scoring context of play. As mentioned above you can remove these if necessary, but you also lose one of the key drivers of pizza value. One of the main tools you have for adjusting the perceived value of a pizza slice is with the placement of these specials. You wouldn’t ruin the game by losing them, but you would limit its scope. As far as memory is concerned, almost all key information is represented in the game as it is being played. The rules explicitly state that collected sets are retained face up, and the only face-down information relates to the number of pepperoni slices that have been eaten. Little is lost if this information too is kept face-up. We’ll recommend New York Slice in both categories, but bear in mind it will likely be necessary to house-rule a happy medium between the game systems and cognitive complexity of play. With some experimentation, we’re sure you could come up with a satisfying balance that works for everyone. The game play is explicitly one of upstream competition so the choices you have available to you are highly filtered by the choices everyone else makes. The initiative here varies from turn to turn though, so you’re as often the beneficiary of this as you are the victim. Sometimes you have the last pick, sometimes you have the first. When you have the last pick, you always get a slice that you yourself separated out so you have the opportunity at the start of your turn to minimise the impact to yourself. Players are absolutely incentivised to deny opportunities to others – the scoring rules have a ‘winner takes all’ system for sets of slices,. As such if you are competing with someone else for a set they will almost certainly deny you what options they can. Even players with no particular dog in that fight might look at your collected pizza slices and decide you are a threat to their own success. There are few penalties other than in terms of opportunity that go with denying someone a slice of pizza that is optimal for them – any sets you’re not collecting can instantly be eaten for their pepperoni value. The slicer of a pizza may explicitly devalue a slice by placing negative specials on it, and if that slice happens to be one you are especially seeking that’s a targeted form of aggression that’s hard to deny. That said, this all has to be balanced against the etiquette of play – everyone is in essence incentivised towards some degree of fairness in distribution since they’ll get whatever slice they make the least valuable. As such, while pointedly torpedoing the opportunities another player has is possible, it’s usually at least a partial act of self-sabotage and as such not a usual state of affairs. It’s possible as the second last player to receive a poor choice meant for you and simply bat it on to the person that served it up. We’ll recommend New York Slice in this category, although for groups where emotional control issues may need to be considered it might be worth adopting one of the lower impact scoring regimes discussed in cognitive accessibility section above. Edit: Both salty-horse and VirtualAlex in the comments have interesting thoughts on the dietary implications of the theme. I hadn’t considered there might be religious, lifestyle or ethical objections so perhaps bear those in mind where appropriate. New York Slice is a game of physical interaction with pieces in reasonably tight constraints, but it’s also one where the key accessibility issues accrue only when one is the active player engaged in slicing. 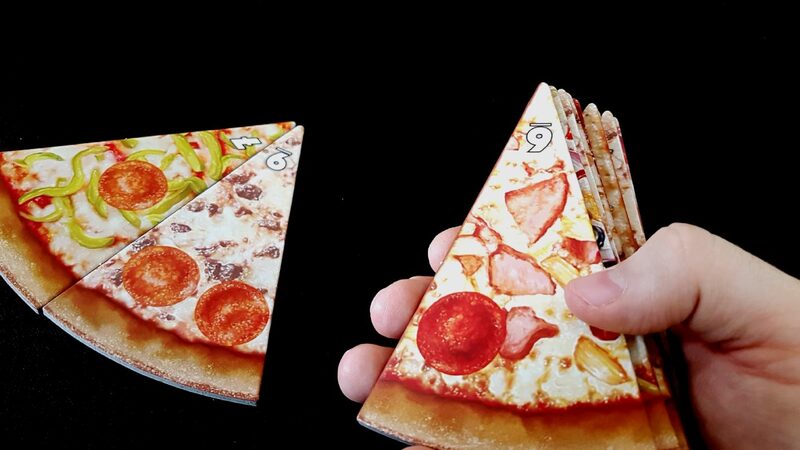 At least, that’s true outside of setup which is a pain for everyone involved since it requires the shuffling of sixty-nine tiles (almost always done in a wash shuffle, and that’s not necessarily easy) and then the segregation of those pizza slices into stacked piles. It’s an issue of fine motor control here, but also range of movement. Players with accessibility restrictions will need another player to handle setup. For everyone aside from the active player, their turn involves deciding between one of a number of pizza sections and selecting one. Those slices then get broken up into the sets to which they belong. That’s an action that is very easy to verbalise, and the box even comes with a few blank ‘specials’ tiles that could be used to indicate the start of numerical indexing. ‘Where this tile is, that’s our first slice’ which permits for verbalisation to be as simple as ‘I’d like the fifth slice, thanks’. When taking the role of the active player, the profile of physical accessibility shifts. The job becomes one of selecting a stack of pizza slices and dealing it out into a circle (as neat or otherwise as you like) before placing a specials tile. That at least is possible for someone else to do on behalf of a player with physical impairments. The separation of a pizza into its slices though is more problematic because it’s almost always going to involve a degree of prevarication and changing of mind. Segments will be swapped between slices, or merged, or separated. That’s certainly possible to do through the issuing of instructions, but cumbersome. The physicality of being able to do this independently will greatly reduce the difficulty of the task since it eliminates an otherwise unnecessary layer of conversational abstraction. 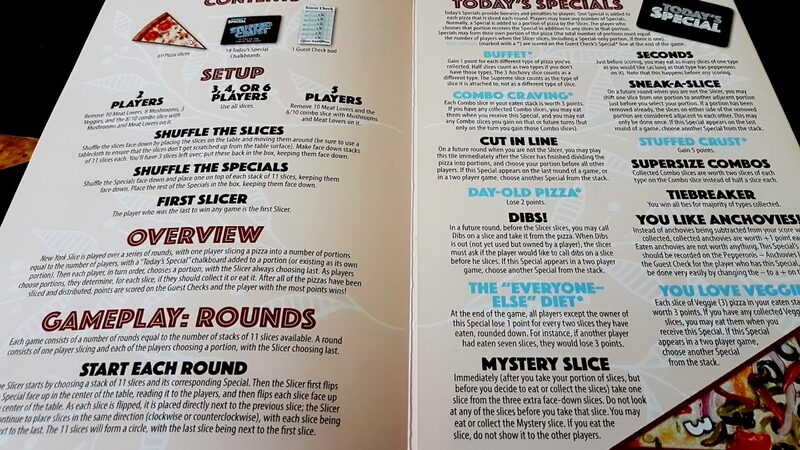 This said though, we’re still prepared to tentatively recommend New York Slice in this category since most of the time a player won’t be slicing the pizza and those times they are can be managed even if it’s a little awkward and inconvenient. No complaints here. There is no gendered artwork, the manual doesn’t default to masculinity, and while the game does seem to have an issue with people that like anchovies I’m not sure that can be considered discriminatory in the usual sense. Cost comes in at around an RRP of £30, which might seem a lot for such a simple game but really you need to look at what comes in the box to see where the money goes. 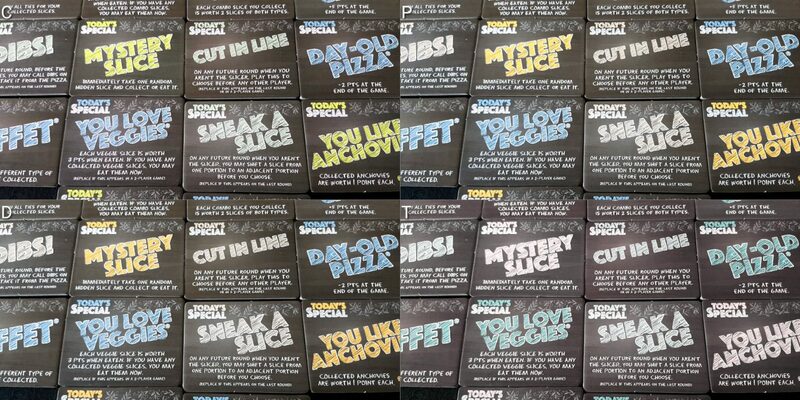 The production values are sky-high here – the box is thick and chunky, and comes complete with almost seventy pizza tiles and a dozen specials. It scales up to six players, which is great, and all the way down to two. BGG recommends it at all levels, but my own experience at two players is that it is dreadful. You can very easily house-rule variants though. 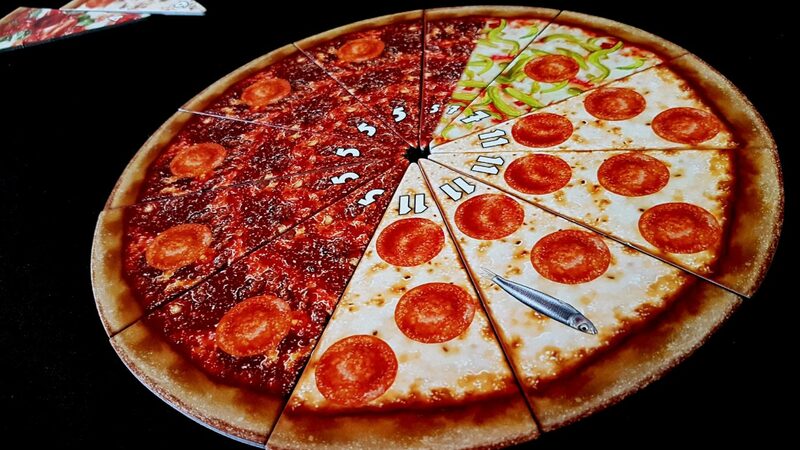 In two player games, you separate the pizza into two slices and each take one. My recommendation is that you separate it into three and discard one at the end, or into four and alternate the taking of slices. That then turns it into a game that genuinely does scale well, even if the two player variant is the least satisfying of the lot. New York Slice also has a key benefit in that it’s a suitable option for all kinds of groups and all kinds of scenarios. It is mechanically very light, and yet strategically relatively deep. The theme is charming, and the rules so simple you can explain them in ten seconds. As such, you will find a lot of opportunities to get your money’s worth out of the box. This isn’t one you’ll buy and then never be able to get to the table – I’ve played this many times with many groups since buying it, and it’s been a hit for all group compositions. There is a small associated reading level, but this is linked to the specials tiles and can be dealt with through crib sheets or ‘just in time’ explanations. With experience, the issue will be resolved because none of the specials are particularly complex, nor their impact difficult to memorise. There are no other requirements for formal communication during play. The nature of the game is that it tends to take up a reasonably large amount of space on a table, and a degree of reaching or leaning over is necessary to interact with the game or inspect what another player may be doing. While this isn’t enough to change our recommendation in the visual or physical categories, it could be something to bear in mind for the intersection of both especially given the issues of differentiating slices discussed above. The verbalisation we discussed in the section on physical impairment is tightly coupled to both the cognitive cost of parsing the slicing, and the ability of someone to articulate potentially intricate segments. As such, if dealing with the intersection of any two of these conditions we would be inclined to recommend other games, and if dealing with all three we’d strongly recommend you avoid New York Slice. The play-time of New York Slice is listed as around 30 minutes, and that seems in the right ballpark for a six player game. Obviously, accessibility compensations will have an impact here. This is brisk enough that it is unlikely to exacerbate issues of discomfort or distress. However, even if this is a consideration New York Slice supports easy dropping out of play – you simply slice the pizza into fewer sections. Accumulated segments will still be in the missing player’s possession, but none of the scoring is dependent on full availability of these. New York Slice employs a competition model that is simultaneously intense and collegiate. You’re all deeply invested in what everyone else is doing, but none of you have any great ability to influence the success of others through anything more than denying them opportunities. When a player’s turn comes around, you’ve already missed your chance to potentially undermine their efforts. There is no risk to players offering full accessibility support if necessary. We liked New York Slice a lot – it got four delicious stars in our review, and each of them was lovingly prepared by an authentic Italian chef in a pristine kitchen. We give out stars as grudgingly as the Michelin guide on occasion, so you know you’re on to a winner here. While New York Slice isn’t uniformly accessible, it’s likely to be broadly accessible to the majority of potential players. Even in the visual category, we made note that if a visually impaired player really wants to play they’ll work out a system. The cost, we suspect, is greater than the benefit but if the will is present then the way will be found. Our other key concerns relate to the physicality that goes along with slicing the pizza, and again a motivated player will certainly be able to overcome this. I’ve said several times now that I didn’t expect to like New York Slice, and I certainly didn’t expect to like it as much as I do. It’s almost certainly going to be a firm regular whenever I’m introducing gaming to new people, or just looking for something fun and breezy to play. Like pizza itself, New York Slice is a reliable crowd-pleaser and you’d be well served by having it available when a group comes over for an evening.